Sarah Loewe is a mix of thin and fat-shaped glyphs as a fun script typeface, created manually using brush pen. 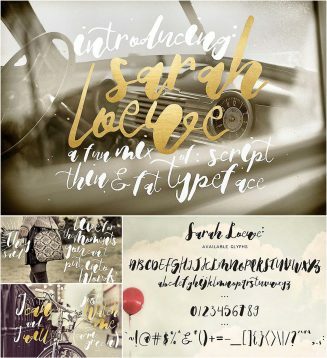 With a complete glyph available in the family, you can use Sarah Loewe to create greeting card title, signature for design work, badge and sticker, logo and return address, some cover design and so forth, you decide! Tags: brush, feminine, glyph, script, serif, wedding font.